The last of America's most powerful Cold War-era nuclear bombs - the B53 - has been dismantled in Texas. Carried by B-52 bombers, the "bunker busters" used five parachutes to land softly on their targets before detonating a nine megaton explosion, in effect simulating an earthquake. The US Department of Energy's National Nuclear Security Administration (NNSA) has said the programme, which was completed once this final bomb had been dismantled, is a year ahead of schedule. The head of the NNSA, Thomas D'Agostino, called the decommissioning of the last B53 a "significant milestone". "The world is a safer place with this dismantlement," he said. "The B53 was a weapon developed in another time for a different world. Today, we're moving beyond the Cold War nuclear weapons complex that built it toward a 21st Century nuclear security enterprise." After disassembly, the uranium pits from the bomb will be temporarily stored at the Pantex plant near Amarillo, Texas, where Tuesday's dismantling was carried out. The plant is the only nuclear weapons assembly and disassembly facility in the US. 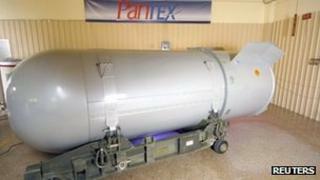 The plant is likely to be involved with future disassembly projects as older weapons are retired. According to figures released by the US state department in May 2011, the US has 5,113 nuclear warheads in its current stockpile, down from 31,255 in 1967.